Be whisked away by private vehicle to the Napa and Sonoma valleys on a personalized, 6-hour wine tour. You'll benefit from a customizable itinerary, which makes for an unforgettable excursion in this premier wine region of Northern California, located just 45 miles north of San Francisco. Pricing is per group, based on a maximum of six people; wine tasting fees not included. Start your customized winery tour with private pickup from the San Francisco airport or your centrally located hotel. You can choose among 400 or so wineries that make up the Napa and Sonoma wine country. Relax while you pass by a rural patchwork of vineyards featuring a range of grape varietals that include cabernet sauvignon, cabernet Franc, merlot, zinfandel, malbec, chardonnay, pinot noir, sauvignon blanc, and syrah in addition to tempranillo, muscat, sangiovese, and late harvest wines. Design your 6-hour route with your personal guide and learn about the wines you taste (fees not included). 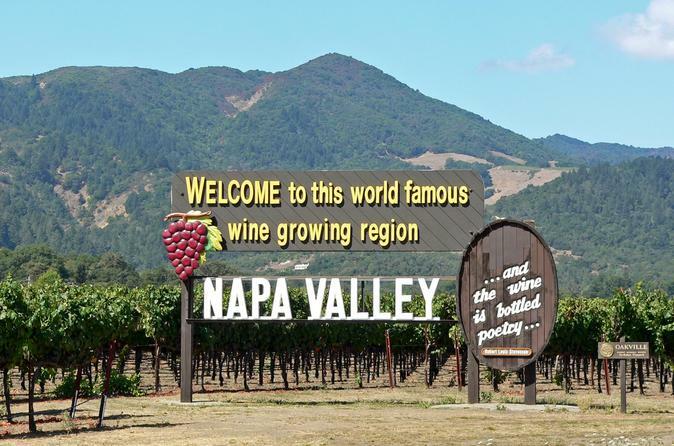 Head to your destination of choice in Napa or the Sonoma Valley and select among large, renowned wineries or boutique family-run establishments where you'll often meet the winemakers. In addition to area wineries, you'll find a variety of restaurants, art studios, and specialty shops selling gourmet goods, lavender, artisan cheese and more in charming towns and locales such as the Sonoma Plaza, a National Historic Landmark. After your tour, settle in for the return drive to San Francisco.